In gardening, there are times for instant satisfaction and times to be patient; there are instances when playing it safe is the wisest option, and others when it’s worth taking a risk. Striking the right balance is part of the gardener’s art. 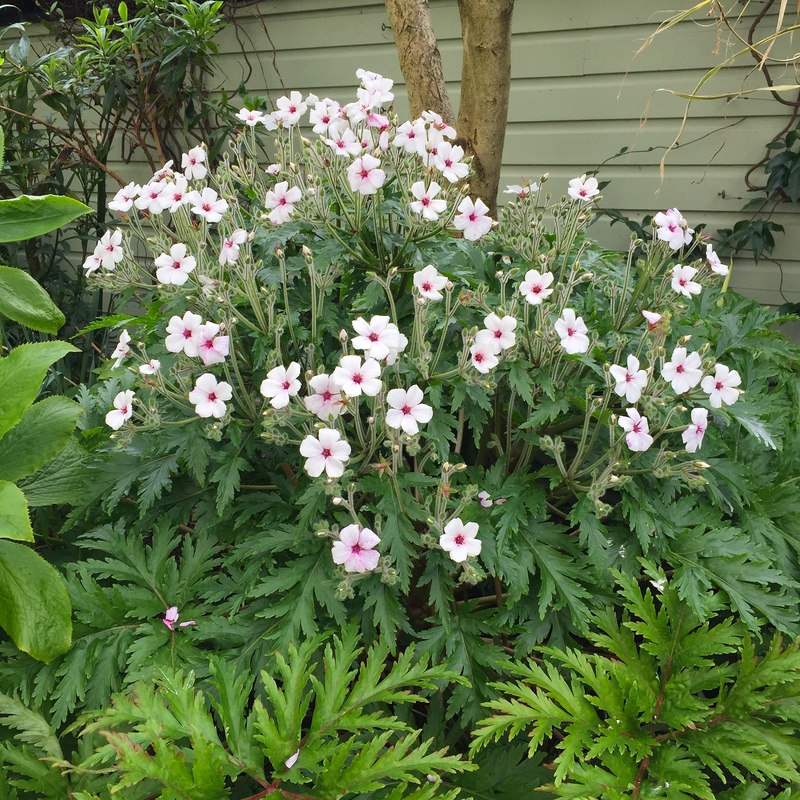 Since the birth of our seaside garden I have been growing Geranium maderense, a handsome herbaceous plant from Madeira. It is a plant that demands patience, tenacity and frost-free winters if you want to grow it outside. Whilst I may be found lacking when it comes to the first two qualities, in this case I have forced myself to persevere with these beautiful flowers because they are so stupendous when they do eventually bloom. Some gardeners grow them in pots so that they can be protected under glass over winter, but I have never seen one grown in a container look half as good as one planted in the ground, where they can achieve an incredible size. As I write this post from my garden table I am surrounded by six luxuriant plants, each having survived at least two frost-free winters. This is the first hurdle for anyone trying to grow these beauties: they are only worth taking a gamble on in the mildest parts of the UK. If lightly frosted plants may recover, but the main stem, which is more of a trunk, has a tendency to rot when disease gets into any damaged tissue. We have experienced winters where every plant in the garden has been wiped out, which is heartbreaking – so much so that on occasion I have considered not replacing them. However, once one has persuaded a single plant to flower, which may be two, three or four years from germination, then one will have Geranium maderense for life. The seeds are plentiful and germinate freely, although seedlings prefer not to be disturbed once they have chosen their spot. 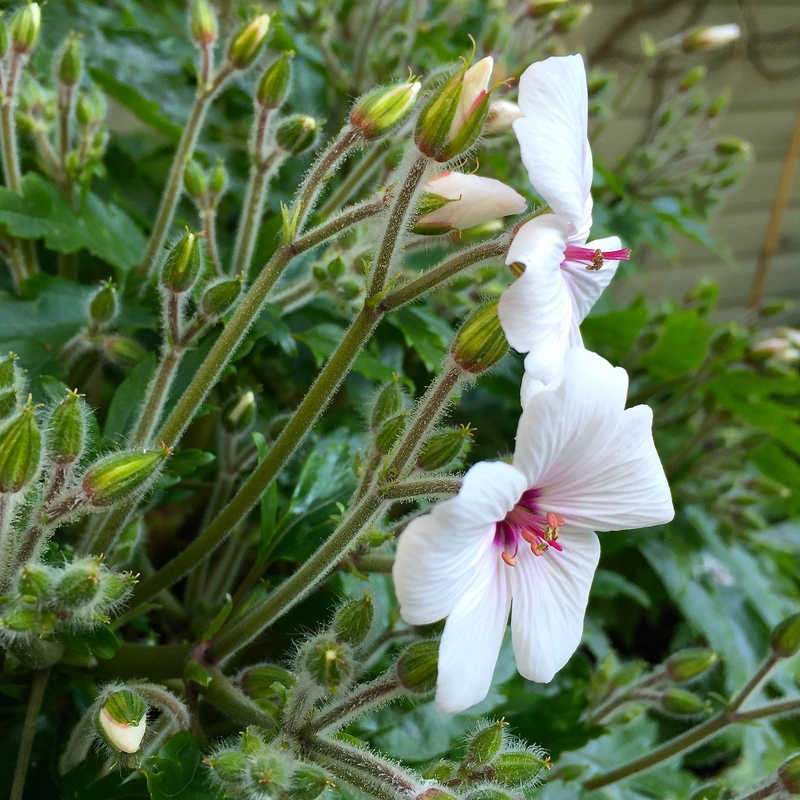 For the last six or so years I have been trying to get a white cultivar, Geranium maderense “Guernsey White” to flower. (If Him Indoors had his own way I would only grow white flowers). The first batch of seedlings all perished when, too big to be kept indoors over winter, I planted them out and they caught a chill. From a second batch I grew-on three plants, one of which I planted in the shelter of a tree. This is the specimen that has started to flower this week and which sends a shiver of excitement down my spine every time I gaze at it. Unlike the Barbie-pink flowers of the species, G. maderense “Guernsey White” has brilliant white petals, crinkled like crepe paper, arranged around a small magenta eye. Each flower is about the size of a 50 pence piece and is unscented, although en masse I have known the pink version smell like a damp dishcloth. That aside, the flowers will now be produced in great profusion for months before the whole plant collapses and dies. That’s the reward one gets for one’s bravery and fortitude: a plant one rarely sees growing in any other garden going out in a blaze of glory, followed by a lovely big gap in which to replant with the same, or something different. What could be better or lovelier? Look out for updates on the geranium’s progress on my Facebook Page. 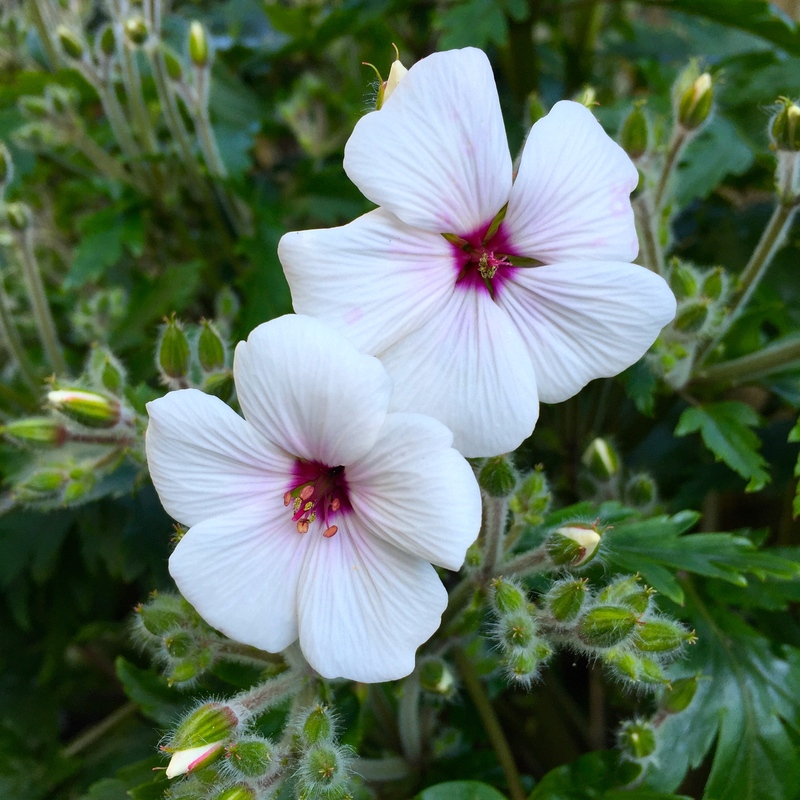 Seeds of Geranium maderense “Guernsey White” are available from Plants of Distinction. Wishing you a wonderful week in your gardens. TFG. Oh well done, it’s definitely worth the wait. Staggering ! Thrilling. Do you have any waiting in the wings to bloom next year or will you have to wait a further 3 years for the next showing. Hi Frances. I have two smaller white ones and three or four pink ones that are almost flowering size. I thought some of the pinks might bloom but they are holding back for another year. I sow a few seeds every April, but have a ready supply of self sown plants popping up in pots and tubs. Glad you enjoyed the post! I have G. ‘Guernsey White’ growing in the ground in my unheated greenhouse. This is its second year but no flowers yet. Seeing yours I just can’t wait for it to bloom. Stunning! I think this plant may be four years old Chloris. I can’t remember now. I am hoping it comes true from seed so that I can nurture a few offspring for future years. Planted in your greenhouse border it should do as well, if not better than mine. Omygoodness! Hard work and perseverance pays very well – hats off to you! 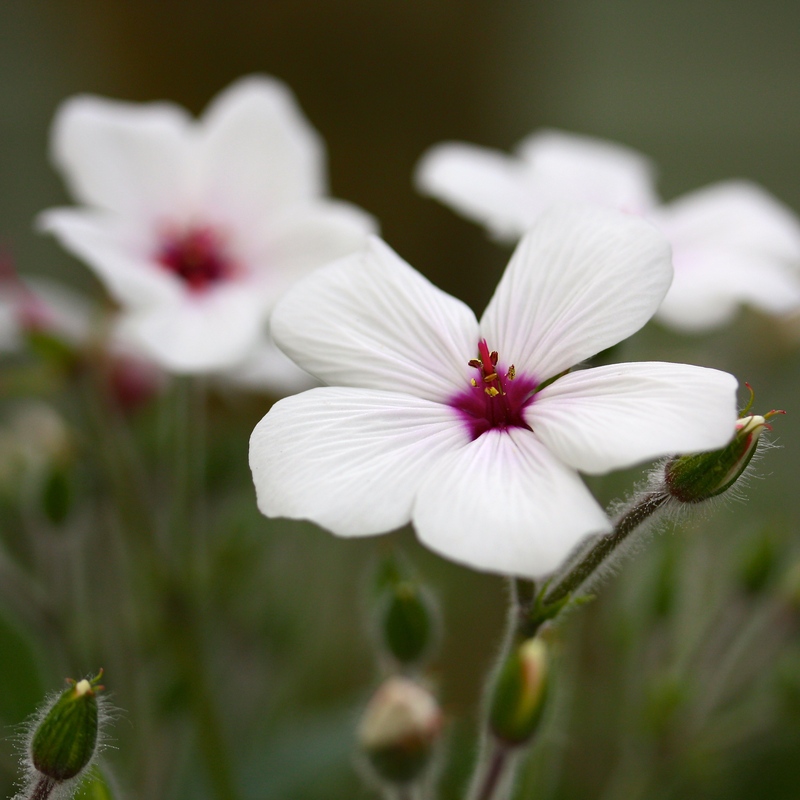 Wonderful to have that simple white flower with the exquisite touch of magenta appearing now in your garden. Thank God that nature decides to send such a beautiful flower at this time of year – to be quite honest I’m ‘yellowed out’ so to see your photos this morning, well…………………..
Our seaside garden is now approaching its white phase. This is historical because when we planted the garden it was early May and we wanted all white flowers. The hot colours took over long ago but just for a short time in May and early June we go from yellows and oranges to cool white and green before the summer show starts. Have a good week Sally. Absolutely gorgeous. I have tried but failed. I think that both inside and out, conditions are just too extreme, so I probably won’t torture myself trying. But, my, how beautiful. Big well done. When taking a risk becomes torture it is definitely time to back down, if only temporarily! I am guessing Madeira is on the warm side of temperate and greatly moderated by the surrounding sea, so the plants that flourish there probably don’t enjoy either extreme. 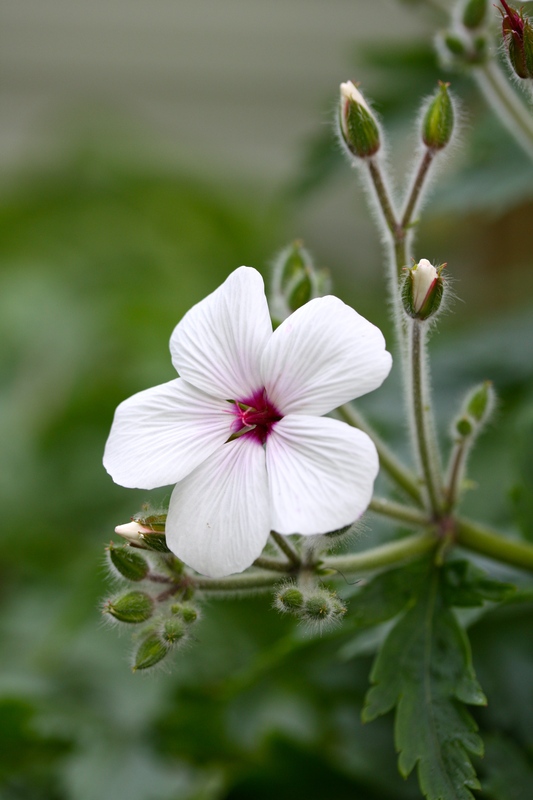 Geranium palmatum and G. psilostemon are good substitutes for stature and flower power. Oh, how beautiful! Also, your observations about G.maderense borderline hardiness are fascinating. I’ve lost the pink one here a few times, so switched to G.Palmatum which seems to be made of sterner stuff and self-seeds with gay abandon. I shall be sniffing the air with interest in a few weeks! Yes, G. palmatum is no trouble, although it dislikes wet, heavy soil in my experience. It lasted only one season in our London garden, but the oldest plant in Broadstairs is now nine years of age and has a 2ft trunk. You have nice dry, well-drained conditions so I am sure it likes you! Thanks, Dan. The additional info is v.interesting. I will keep you some seedlings, or some seeds – just let me know which you’d prefer. I have plenty of seed if you’d like me to pop some in the post at the weekend? They germinate in about 5 days. I am impressed your friend manages to keep Geranium maderense growing outside in Winchester. There is hope for other southern gardeners then! Well done for persevering with it and taking that gamble! Myself, I’m similarly excited about a Metrosideros which has buds for the first time in years: usually the tips of the branches are cut back by this “one night of frost in the entire winter” and then that was it (it’s in a pot, but too big to bring indoors). Keep having nightmares about snow in April (as we had a couple of years ago), but surely nature can’t be that cruel? Please do post a pic of your (white) G. maderense in full flower here, too – for those of us who aren’t on facebook! It must look absolutely stunning. Lovely – I’ve never seen a white one before. They are rarer than hens’ teeth Susan, but very easy from seed. Such a pity they die after flowering. That and tenderness probably put a lot of people off. Simply spectacular and well done you! And please do keep us up to date with photos as I’m not on facebook either. Funnily enough, I’ve just received a seed order this morning with packets of both the pink and the white. Very exciting, and while I could never be accused of being a successful raiser of seeds, (thank heavens the World Seed Bank doesn’t depend on me) this time I’m going to make a really stupendous effort. In time, all going well, I will have to cover the plants with frost fabric each night to get through the winter but oh, it will be so worth it. Hi Anne. You should have no problem growing Geranium maderense from seed. Perhaps sow them in modules so that you don’t need to disturb them so much later on. And keep them inside for at least the first winter. Good Luck!! Quite! I am sure you have achieved greater things in your illustrious career, but little things please me. I will, however, be flaunting photographs of my geranium in full bloom very soon. We are due our annual meet up soon, surely? Yes. Trying to work out when we can get away depending on what builders are up to!